ZoomSphere has created this privacy statement (“Statement”) in order to demonstrate our commitment to customer privacy. Privacy on the ZoomSphere web site (the “Site”) is of great importance to us. Because we gather important information from our visitors and customers, we have established this Statement as a means to communicate our information gathering and dissemination practices. We reserve the right to change this Statement and will provide notification of the change at least thirty (30) business days prior to the change taking effect. We require customers who register to use the services offered on our Site (collectively, the “Service”) to give us contact information, such as their name, company name, address, phone number, and e­mail address, and financial qualification and billing information, such as billing name and address. Customers can update or remove their personal information at any time by logging into the Website and editing their Personal Information within Settings. Customers can view their updated profile to confirm their edits have been made. ZoomSphere uses the information that we collect to set up the Service for individuals and their organisations. We may also use the information to contact customers to further discuss customer interest in our company, the Service that we provide, and to send information regarding our company or partners, such as promotions and events. Customers are invited to receive an email newsletter by providing an email address. Customer email addresses and any personal customer information will not be distributed or shared with third parties. Customers can opt out of being contacted by us, or receiving such information from us, at any time by sending an email to info@zoomsphere.com. Separately, customers are also asked to provide an email address when registering for the Service, in order to receive a username and password. We may also email information regarding updates to the Service or company, and will send a Customer Newsletter. Again, email will not be distributed or shared and customers can opt out of receiving any communication by emailing info@zoomsphere.com at the time it is distributed, or at the time any customer registers for the Service. If explicitly not stated otherwise when requesting information, we do not disclose to third parties the information provided. All financial and billing information that we collect through the Site is used solely to check the qualifications of prospective customers and to bill for the Service. This billing information is not used by ZoomSphere for marketing or promotional purposes. Customers of the Service will be using the Site to host data and information (“Customer Data”). ZoomSphere will not review, share, distribute, print, or reference any such Customer Data with exception of the law requirement. Individual records may at times be viewed or accessed only for the purpose of resolving a problem, support issue, or as may be required by law. Of course, customers are responsible for maintaining the confidentiality and security of their user registration and password. ZoomSphere may also collect certain information from visitors to and customers of the Site, such as Internet addresses. This information is logged to help diagnose technical problems, and to administer our Site in order to constantly improve the quality of the Service. We may also track and analyse non­identifying and aggregate usage and volume statistical information from our visitors and customers and provide such information to third parties. If a user elects to use our referral service for informing a friend about our site, we ask them for the friend’s name and email address. ZoomSphere will automatically send the friend a one­time email inviting them to visit the site. 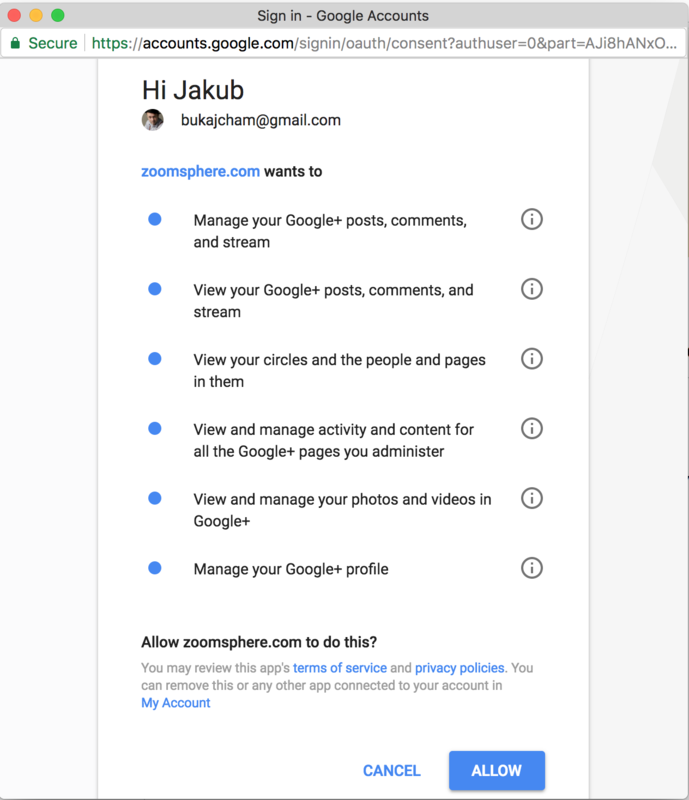 To run your G + page with our application, you need to confirm the range of permissions that you see on the following screen. We do not use your data for any other purpose or pass it on to third parties. When you interact with the ZoomSphere Website we strive to make that experience easy and meaningful. When you come to our Web site, our Web server sends a cookie to your computer. Cookies are files that Web browsers place on a computer’s hard drive and are used to tell us whether customers and visitors have visited the Site previously. Standing alone, cookies do not identify you personally. They merely recognize your browser. Unless you choose to identify yourself to ZoomSphere, either by responding to a promotional offer, opening an account, or registering for a trial, you remain anonymous to ZoomSphere. Cookies come in two flavours: session and persistent­based. Session cookies exist only during an online session. They disappear from your computer when you close your browser software or turn off your computer. Persistent cookies remain on your computer after you have closed your browser or turned off your computer. They include such information as a unique identifier for your browser. ZoomSphere uses session cookies containing encrypted information to allow the system to uniquely identify you while you are logged in. This information allows ZoomSphere to process your online transactions and requests. Session cookies help us make sure you are who you say you are after you have logged in and are required in order to use the ZoomSphere application. ZoomSphere uses persistent cookies, that only ZoomSphere can read and use, to identify the fact that you are a ZoomSphere customer or prior ZoomSphere Website visitor (whatever the case may be). We are especially careful about the security and confidentiality of the information stored in persistent cookies. For example, we do not store account numbers or passwords in persistent cookies. Users who disable their Web browsers’ ability to accept cookies will be able to browse our Website but will not be able to successfully use our Service. The Site contains links to other web sites. ZoomSphere is not responsible for the privacy practices or the content of these other web sites. Customers and visitors will need to check the policy statement of these others web sites to understand their policies. Customers and visitors who access a linked site may be disclosing their private information. It is the responsibility of the user to keep such information private and confidential. Our Site has security measures in place to help protect against the loss, misuse, and alteration of the Data under our control. When our Site is accessed using Netscape Navigator, or Microsoft Internet Explorer versions 6 or higher, Secure Socket Layer (SSL) technology protects information using both server authentication and data encryption to help ensure that Data is safe, secure, and available only to you. ZoomSphere provides unique user names and passwords that must be entered each time a customer logs on. These safeguards help prevent unauthorised access, maintain data accuracy, and ensure the appropriate use of Data. ZoomSphere offers its visitors and customers a means to choose how we may use information provided. If, at any time after registering for information or ordering the Service, you change your mind about receiving information from us or about sharing your information with third parties, send us a request specifying your new choice. Simply send your request to info@zoomsphere.com. If customers need to update or change registration information they may do so by editing the user or organisation record. To update a User Profile, log on to ZoomSphere and select Settings to add or update information. To update billing information please email sales@zoomsphere.com or call +42 (0)739 315 450. To discontinue the Service and to have data deleted, email sales@zoomsphere.com or call +42 (0)739 315 450. ZoomSphere will respond to your correction or update request within at most 7 days from the date of your request.